Nice conditioner for long hair. I really like Clairol Herbal Essences Tousle me softly conditioner because it doesn't weigh my hair down. It's a heavy enough conditioner that my hair looks very smooth when I use it, but it is not too heavy that it makes my hair look flat. This conditioner makes my hair feel light and manageable. My curls stay in when I use this conditioner and my hair looks like it has a lot of volume. My hair looks extremely healthy when I use this conditioner. It also doesn't hurt my color or make it turn orange or fade it. I have thick hair but it is also fine so it is important to use a conditioner that won't make it look stringy and this conditioner makes it look super healthy and shiney. This conditioner is a mid-priced product and it is very easy to find at any grocery or drug store so I consider those things a plus. This conditioner also has a pleasant scent that is not overwhelming. Clairol Herbal Essences Tousle Me Softly Conditioner will soften your hair in a wonderful way. This conditioner is great for hair that is dry and frizzy. My hair gets frizzy sometimes and I don't like the way it looks. It makes my hair hard to comb and brush. This conditioner make the frizziness a thing of the past. It also makes blow drying my hair a breeze. My hair becomes light and airy after I use it. It doesn't make my hair flat either. The heavy feeling I have before I use it is gone. It makes my hair shine. This conditioner did not over condition my hair. I like the smell of this conditioner because it smells fresh and clean. It is a great de-tangler as well. This conditioner will do a fine job on "thin, thick and short hair". I think it will work well on most hair types, except for people who have dandruff. I like the pretty color of the container and the fancy writing on it too. This stuff is pretty effective. The price is reasonable as well. I like to buy mine when there is a buy one, get one deal. This conditioner will make your hair look even better if you use the shampoo too. I really like this conditioner. 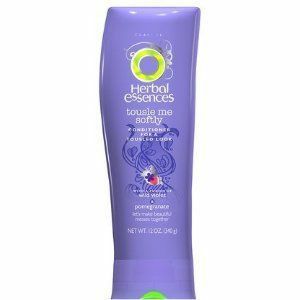 I have previously and in the past purchased and used this Clairol Herbal Essences Tousle Me Softly Conditioner and found that I liked it alright but I probably want ever use it again. I can say that first of all as a conditioner it did leave my hair feeling soft like it said it would. It did not leave my hair feeling dry and brittle like pine straw. Now it did leave my hair feeling soft but it still had some frizziness to it which I did not like. Even though it did leave my hair soft it did not add a lot of moisture to it. It did do a good job of detangling my long hair as well. One thing I did not like about this Herbal Essences Tousle Me Softly Conditioner is the scent. It is way to strong and over powering. When I went to bed for the night I could still smell it very strongly even though I had washed my hair that morning. That is too strong for me. Plus I really did not like the scent either. The price on this conditioner is pretty reasonable so most people should be able to afford it. I would just suggest everyone make their own decisions on this product. Great for all hair types, not just curly. 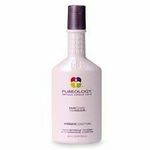 This conditioner works well with both curly and straight hair. 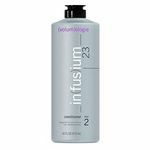 I've also used it on my color treated hair with no adverse affects. 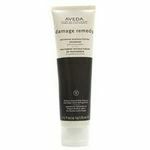 It isn't too expensive and it's wonderful because it is thicker and richer than most conditioners. A little bit goes a long way and it spreads/smooth's out easily in my hair. It has a wonderful scent and pairs nicely with any shampoos. The conditioner is where the real magic happens. Effectiveness It does a great job of smoothing out my hair. It gives it a nice bounce and it scents it just right. It keeps my little flyaway pieces at bay and it is great with frizziness. I've also noticed that it helps keep new, shorter pieces of hair from sticking up in every direction. It detangles nicely and works well to protect split ends. It goes great on its own or paired with the matching shampoo. I have color treated hair and it does well with that also. It leaves my hair soft no matter whether I blow dry, straighten, or air dry my hair. Scent I love the scent of this conditioner as well as all their others. It is very feminine and lasts for days and days in my hair. If you don't wash and condition very often but love the subtle scents being left behind, this line if for you. It isn't very male friendly in the scent department, however. This conditioner is pretty good because I get soft and moisturized hair from using this. It is bad to shampoo wash my hair more than 3 times a week because it dries out my hair because of how thick and curly it is. This conditioner allows me to give my hair a conditioner only wash during that time to ensure that my hair remains moisturized and soft. I really like this conditioner because it allows me to have soft clean hair that remains strong and vibrant without the use of shampoo. Effectiveness I expected to get soft hair and that's exactly what I got by using this conditioner. It is fairly light and spreads great to get my thick curly hair moisturized and soft. I liked how light my hair feels after using this as well and I think it is great to try when your hair needs that quick pick me up. Scent This conditioner has a nice clean floral scent that makes you know you just got a great wash. I love how soft my hair looks and feels after using this and people often compliment me on the scent of my hair after using this. I use this conditioner with the matching Herbal Essences Shampoo. I have medium curly thick hair, shoulder length, and frizz is a big issue for me. This is an okay conditioner. I feel like it could deliver a lot more on the moisture as well as help keep my curls better. I don't think this product works any better for curly hair than a conditioner that is not for curly hair. My hair is still just as frizzy using this vs. not using this product. I live in Florida, so I know it's part of the climate, but this product does not help me at all with frizz. It could be the shampoo, but I feel like they should work well together. I do love the scent and the price though. It's also easy to find just about anywhere. This product does last a long time, even the smaller bottle. I feel like I don't go through it as fast as other conditioners. Effectiveness I don't really think it works all that well for curly hair and it could be a lot more moisturizing. Scent I love the smell, it's very refreshing and I enjoy using it because of the smell. The herbal essence line of products have always been a staple in my beauty arsenal. They are decently priced, easy to find, and carry a full line of varieties. They work well with my hair and my skin and scalp do not break out with the use of their product line. My hair is naturally curly and is about half way down my back when dry. The underside of my hair seems to curl up tighter than the top layer. As with most people with curly hair, my hair will do as it pleases most days. My only hope is to somewhat control it. I started using the toussle me softly line of Herbal Essence when I came across it being on sale in the store. I bought the shampoo, the conditioner, and a thing of mousse. I was on a mission to tame my unruly frizz and hopefully soften my hair in the process. After using the conditioner for about a week, I noticed my hair had soften and seemed to be more manageable. The conditioner itself has a pleasant fragrance and does not weigh my hair down. However it seems to provide adequate moisturizing to my hair. 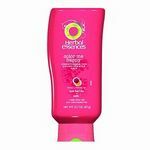 I love the new Herbal Essence Tousle Me Softly Conditioner! Goes great with the Tousle Me Softly Shampoo too. I love the smell, the look of the packaging, the soft and managable results I got after using this conditioner. Usually, conditioners make my thick and wavy hair dull and flat. Not with this new product. I had no problems with flatness. My hair was so poofy which I loved. No need to use a curling iron or hot rollers after using this product. Just wash, and blow dry and you are DONE! I had such shinny results that I swear I'll never go back to my regular conditioner. I am hooked on the new Herbal Essences Tousle Me Softly Conditioner. In fact, I can't wait to try all of their other Tousle Me Softly products. I'd recommend this product to anyone! It's a great price and great product to use every time after you wash your hair. Perfect for those wash and go moments. No other styling Needed. Effectiveness makes one's hair soft and shinny and never dull. Scent very nice and pleasant scent that's not overwhelming. I've tried many conditioners over the years because whether my hair was long or short its always thick. So The one important thing I needed was a conditioner that could detangle yet still give waves or better yet curls and on the plus side not be too heavy. Until I tried Tousle Me Softly by Herbal Essences I hadn't found any but that all changed, their product is light with a gentle, fragrant, scent. Now using Tousle Me Softly on my hair, which is long now, I don't have to worry about major tangles or any clumping. I can run my fingers through my hair and the waves just bounce right up..I even get some curls! Its so awesome to have a product like this that really works so well that you don't have to do any work on your hair at all!! I love this conditioner. What first drew me to it was the smell. I always love the way Herbal Essences' products smell, and this was no different. Also, I was looking for something that would allow me to just wash my hair and go, which is hard for me because my hair is curly at best and frizzy at worst. Normally I opt for something that will allow me to straighten my hair, but with this product I did not have to. I could wash my hair and let it dry, and end up with wonderful, beachy waves. And, even better, my hair stayed smooth throughout the day. Also, if I did decide to straighten my hair, it would not kink up as it would with some other products I have used, and my hair would remain ridiculously manageble either way. I would definately recommend this to anyone with hard to manage hair as a simple go to.